OWN's hit drama series "Greenleaf" is the most watched new cable show of the summer, and year to date is the #1 original cable series on Wednesday nights for women. The series delivered record numbers with its season finale last night (8/31) with 2.4 million viewers and a 1.84 women 25-54 rating making it the network's most watched and highest rated Wednesday telecast in network history. The success of "Greenleaf" along with Tyler Perry's "The Haves and the Have Nots" gave OWN its highest monthly primetime rank in network history in August (#12) among women 25-54, while OWN's +11% prime growth over last August made it the fastest growing Top 15 Network on ad-supported cable. The network also delivered two of the summer's Top 3 scripted series on ad-supported cable for women with "Greenleaf" and "The Haves and the Have Nots." 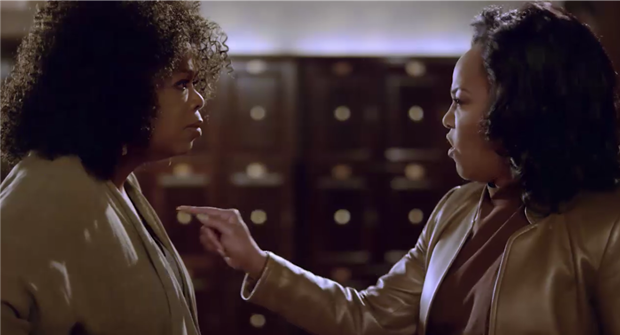 "Greenleaf" (Wednesdays at 10 p.m.) takes viewers into the unscrupulous world of the Greenleaf family and their sprawling Memphis megachurch, where scandalous secrets and lies are as numerous as the faithful. Born of the church, the Greenleaf family love and care for each other, but beneath the surface lies a den of iniquity -- greed, adultery, sibling rivalry and conflicting values -- that threatens to tear apart the very core of their faith that holds them together. "Greenleaf" stars Merle Dandridge ("The Night Shift") as Grace Greenleaf; Keith David ("Community") as Bishop James Greenleaf; Lynn Whitfield ("The Josephine Baker Story") as Lady Mae Greenleaf; Kim Hawthorne ("Rake") as Kerissa Greenleaf; Lamman Rucker ("Meet the Browns") as Jacob Greenleaf; Tye White ("The People v. O.J. Simpson: American Crime Story") as Kevin Satterlee; Deborah Joy Winans ("Whitney") as Charity Greenleaf-Satterlee; Desiree Ross ("Falling Skies") as Sophia; and Oprah Winfrey ("Selma") in a recurring role as Mavis McCready. The series is executive produced by Craig Wright ("Lost," "Six Feet Under"), Oprah Winfrey ("Selma") and Clement Virgo ("The Book of Negroes"). "Greenleaf" is produced for OWN by Lionsgate in association with Harpo Films and Pine City. From prolific producer Tyler Perry, the popular drama series "The Haves and the Have Nots" (Tuesdays at 9 p.m.) portrays the ongoing drama between the wealthy Cryer and Harrington families and the poor Young family. The series stars John Schneider (Jim Cryer) and Tika Sumpter (Candace Young). "The Haves and the Have Nots" is created, written, directed and executive produced by Tyler Perry and produced for OWN by Tyler Perry Studios.